Editor’s Note: Since receiving this letter, the Bell Foundry was evicted following the City’s decision to condemn the building because of multiple code violations. 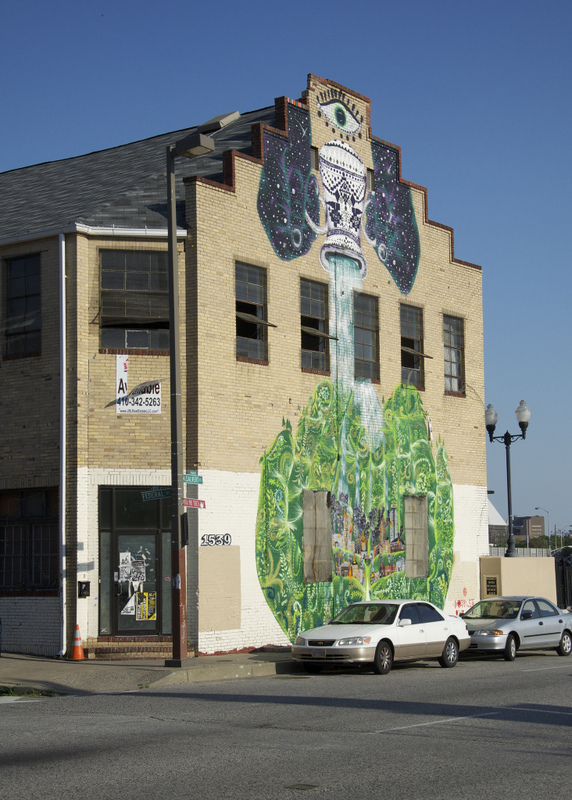 The events at the Bell Foundry and the tragic fire at DIY space Ghost Ship in Oakland, CA, have sparked discussion about the need for safe and affordable artist studios and residences in Baltimore. To that end, Mayor Catherine Pugh formed the Safe Art Space task force, which will be presenting a report with recommendations later this year. AIABaltimore is monitoring this issue for possible assistance that can be provided through the architecture community. I first entered your space almost ten years ago, when a friend invited me to a local music show. I was in awe of your innards. I had driven by many times before, but unaware of your contents, I stayed away, even though your outward appearance seemed ever so inviting. From the unique shape of your stepped roof to the beautiful works of art painted ever so carefully on your tan bricks; a trip down North Calvert Street meant slowing down a little when I cross Federal Street. Your history is like that of many Baltimore buildings. Constructed in the 1850’s, your walls housed a booming business, The McShane Bell Foundry. Producing bells and chimes for tens of thousands of churches and public buildings across the country, music and delight are ingrained in every brick and beam. The 7,000-pound bell that still hangs in the dome of Baltimore’s City Hall was created within your walls. In 1979, the McShane Bell Foundry moved to Glen Burnie. They continue to produce bells and chimes and are the only large Western-style bell maker in the United States, and one of a few dozen around the world. As true then as it is today, the goings on inside your myriad of spaces continues to bring joy and happiness to those who enter. There is a basement venue for performing arts, and an upstairs gallery for visual arts—rooms upon rooms for artists seeking inspiration and clarity. Residents and community members pulled together to build a skate park that would benefit the surrounding area as well as a community garden for all to partake in the fruits of their labors inside your grounds. You bring beauty and delight to all who enter and in many diverse ways. The individuals who take care of you care very deeply about your mission and your well-being. They crowdfund to keep you updated and up to code so that you can continue to be a safe haven for artists and thinkers alike. Within recent years, you’ve served as an assembly place for individuals to discuss problems within the community. Meetings designed to tackle crime, racism, homo and transphobia, sexism, sexual violence and several other matters within the local music scene take place within your walls. Individuals gather in the safe space you provide to express feelings and thoughts on how to improve your neighborhood and community. I’ve attended a handful of meetings and always leave with new questions and new answers to the troubles of Baltimore. The sharing of ideas freely has been a staple of community life in this city and I think it’s wonderful that you’re participating in the discussion to move us forward and bring us together. You’ve dedicated your life to freedom of speech and expression, first and foremost through music and art and eventually spilling out into all areas of city life. Here’s to another hundred and fifty years of being an asset to the people of Baltimore.